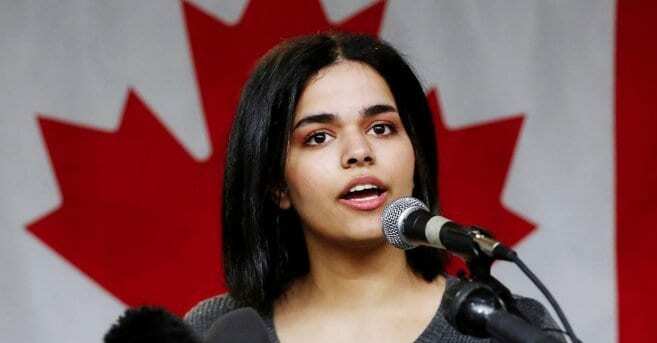 The Saudi teen who fled her home and caused an international sensation by defying her family and denouncing Islam has vowed to fight for women’s freedoms in her first public address since she was taken in by Canada. Rahaf Mohammed al-Qunun captured the world’s attention with a trail of tweets from her hotel room at Bangkok’s airport, where she barricaded her room up after Thai authorities initially barred her from travelling on to Australia. Her emotional social media posts ignited a #SaveRahaf movement as she fled what she describes as a hostile environment, something she could not call home. Saying she was physical and psychological abuse from her family in conservative Saudi Arabia and prompted quick action. Following her social media plea, she was granted refugee status and was welcomed by Canada’s Foreign Minister Chrystia Freeland after landing in Toronto on Saturday. “Today and for years to come, I will work in support of freedom for women around the world, the same freedom that I experienced on the first day I arrived in Canada,” she told a press conference, reading from a prepared statement in Arabic. “I felt that I could not achieve my dreams that I wanted as long as I was still living in Saudi Arabia,” she said. But in Canada, al-Qunun said, she has felt “reborn, especially when I felt the love and the welcome”. Costi executive director Mario Calla said the agency is helping her find long-term accommodations, open a bank account, obtain Canadian documents, and enrol in English classes, as well as showing her how to get around and teaching her “about life in Canada”. Canada’s agreement to take al-Qunun comes at a delicate time for Canada-Saudi relations. Last year, the kingdom froze all new investment with Canada after foreign minister Chrystia Freeland called for the immediate release of jailed rights activists.